The Xp 44 combines impressive performance with simplicity of handling, appealing to all the family. This model was the first of the Xperformance line to be launched, and was named Sailing World’s ‘Yacht of the Year’ in 2014. A highly optimized hull shape offers exemplary performance in a range of wind conditions, on all angles of sail, under both ORC and IRC handicap systems. Key elements of the hull design include reduced upright beam and wetted surface area, while the transom shape ensures that as wind speed builds and the boat powers up, the overall waterline length increases for additional speed. Additional performance is gained through the Xp 44’s exceptional stiffness and high stability, achieved by a high ballast ratio with additional weight in the keel bulb keel, and lightweight structures thanks to epoxy infusion build processes. The Xp 44 introduced the innovative Xperformance bowsprit, with options including a carbon bowsprit to set asymmetrics, a GRP cowling, and optional anchor attachments for hassle-free cruising. The Xp 44 is supplied with an aluminium rig as standard with carbon mast and boom as an option, both developed in conjunction with leading sail makers to create an efficient, easily adjustable sail plan. The Xp 44 also carries multiple halyard options to allow owners to optimize their boat for racing or cruising, inshore or offshore. Standard deck features include a below decks furling drum, low friction racing blocks, and large self-tailing winches (powered winches optional). The Xp 44 also introduced the Xp range’s adaptable new sliding navigation station, supplied as standard, which allows for additional seating or a forward-facing chart table. It is also offered with a fixed chart table option and wooden galley. The three-cabin layout includes symmetrical double aft cabins, a forward cabin with en suite heads, L-shaped galley (now available in a new wooden finish option as shown above), additional heads accessible from the saloon, and spacious seating area around a removable saloon table. Flush-mounted hatches and stylish LED lighting creates a light and welcoming space, day or night. The Xp 44 combines impressive performance with simplicity of handling, appealing to all the family. This model was the first of the Xperformance line to be launched, and was named Sailing World’s ‘Yacht of the Year’ in 2014. A highly optimised hull shape offers exemplary performance in a range of wind conditions, on all angles of sail, under both ORC and IRC handicap systems. Key elements of the hull design include reduced upright beam and wetted surface area, while the transom shape ensures that as windspeed builds and the boat powers up, the overall waterline length increases for additional speed. Additional performance is gained through the Xp 44’s exceptional stiffness and high stability, achieved by a high ballast ratio with additional weight in the keel bulb keel, and lightweight structures thanks to epoxy infusion build processes. The Xp 44 introduced the innovative Xperformance bowsprit, with options including a carbon bowsprit to set asymmetrics, a GRP cowling, and optional anchor attachments for hassle-free cruising. 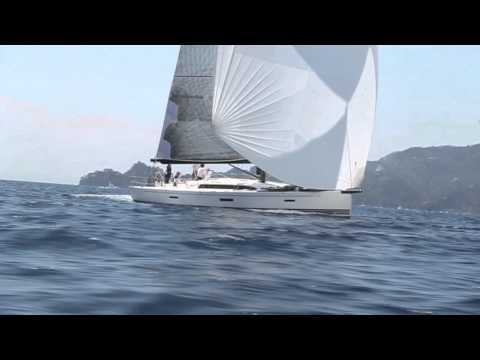 The Xp 44 is supplied with an aluminium rig as standard with carbon mast and boom as an option, both developed in conjunction with leading sailmakers to create an efficient, easily adjustable sail plan. The Xp 44 also carries multiple halyard options to allow owners to optimise their boat for racing or cruising, inshore or offshore. Standard deck features include a below decks furling drum, low friction racing blocks, and large self-tailing winches (powered winches optional). Structural liner moulding laminated into hull. Carbon fiber reinforcements to absorb all loads from keel and mast. Liferaft can be stored in stb aft cockpit locker - max size 800 x 545 x 325. Second liferaft can be stored in port aft locker (max size 730 x 500 x 350). The interior will consist a combination of composite and wooden units. Floorboards of 16 mm marine plywood with imitated teak and Gaboon plywood inlay stripes and inspection hatches to access bilge. To starboard: Standard sliding navigation table (75 cm x 65 cm) with storage for navigational stationary and instruments. The "sliding system" enables the navigator to face forward whilst sailing [sofa length with seat in aft position = 137 cm, sofa length with seat in forward position = 182 cm]. To starboard - Optional 3 cabin version with fixed aft facing nav station: Sofa length of 185 cm, and drawers underneath chart table. All sofa front covered with T-teak veneer. Large double berth (205 cm x 145 cm, max width) Marine plywood mattress support with ventilation holes. Engine control panel and throttle/gear lever placed in starboard cockpit coaming. 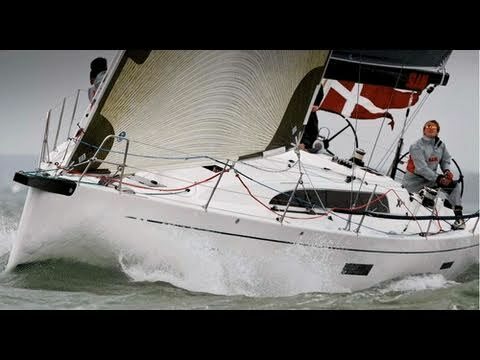 We are the US importers of X-Yachts of Denmark and also handle the Northeast US market. Please give us a call (either Bob or Toby) or email anytime and we would be glad to help. Thanks!